Animals have a very special place in my heart. I’ve loved them since I was a little girl. From big to small, I find all of them beautifully fascinating and it makes me happy when I hear adoption stories. They all make me so happy! Liz shared Tiki’s story and so I decided to share Bucky and his Adoption Story! He has brought so much love and joy into my life and I hope that, when getting a pet, you consider adopting! It’s worth it, I promise! I’ve always wanted a puppy of my own, ever since I was little. We’ve always had pets in my family when I was growing up: dogs, cats and just a few years ago my two rambunctious ferrets. However, since moving in to our new home I felt even more like it was missing something — a four-legged friend. The ferrets were also missing their familiar furry playmate like they had with my mom’s dog Thor, since the cats didn’t seem too keen on entertaining the little guys! Moving out was rough for them. Who were they going to play with? I’ve always felt as though a home isn’t a home without a pet. Though we have our ferrets, they needed a playmate and so did Andrew and I. That was when we decided to start our search for a puppy to adopt and bring home! I instantly hit Petfinder as it had become one of my favorite, and trusted pet adoption websites. 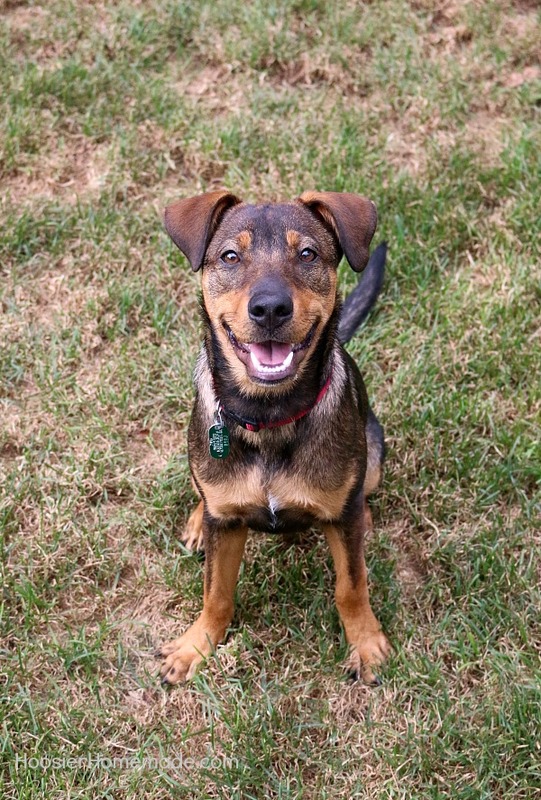 I searched through hundreds of pets that need loving homes and that was when I saw him: Bucky, an adorable German Shepherd/Doberman Pinscher mix. I instantly fell in love with his sweet, goofy smile and immediately put in an application. We were overjoyed to learn that our application was approved! We were so happy and couldn’t wait to meet our little guy and bring him home! Petfinder has launched its #MetOnPetfinder 20th anniversary celebration, the cornerstone of which is a video that shows how adoptable pets have transformed the lives of their adopters. They asked pet parents, pet lovers and pet advocates to watch the #MetOnPetfinder video and share adoption stories using the hashtag #MetOnPetfinder. Thanks to the support of so many pet supporters, Petfinder reached its goal of 1.25 million views by October 24th. Petfinder is donating $250,000 to 25 shelter and rescue members, each receiving a $10,000 grant from the Petfinder Foundation. These grants will help the 25 selected shelter and rescue members to continue to transform the lives of pets in their care, as well as cultivate more lifelong relationships. I’ve always dreamed of having a puppy to call my own. I used to browse through Petfinder hoping that one day I would be able to adopt a pet and give them the best and happiest life I possibly could. Since the ferrets were hoping they’d have a new playmate, I sat down with Andrew and we decided it was time to have a friend of our own. We traveled quite the distance for him, to the neighboring state–about 90 miles–to meet our friend. 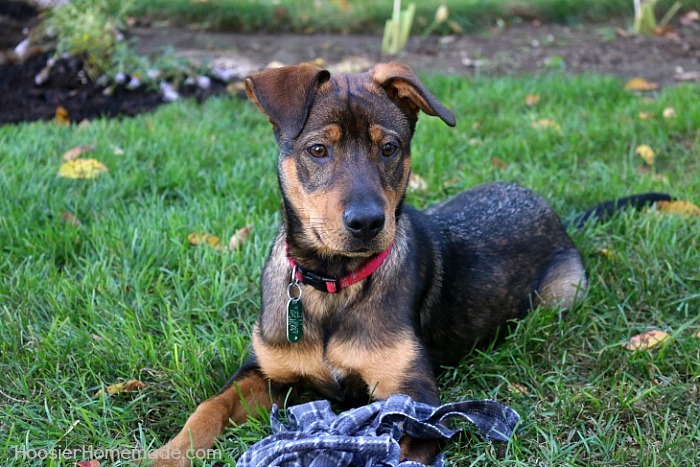 We immediately fell in love with his playful nature and friendly demeanor. He was so excited to see us that his tail was wagging a million miles an hour! We adopted him that day and took him home. Since Andrew and I are both fans of comics and Captain America, we agreed the best name for him would be Bucky — The Winter Soldier. He’s quite the handsome guy, isn’t he? He was quick to make friends with everyone in the family! My parents, Andrew’s parents and even Andrew’s parents’ dog, Tiki! The ferrets love him as well and can spend hours playing games with him like hiding under the bed and popping out to tease him. It’s fun to watch him race after the little guys to see where they’ll be popping out next. There are just so many animals looking for homes, from small animals like ferrets, guinea pigs and hamsters to large barnyard animals like horses and cows. Even though my dream pet has always been a horse, our house isn’t quite big enough for one! Since adopting Bucky, we’ve never had a boring moment. There’s always something happening with him around ,whether it’s chasing after him to get our socks back or him chasing after a toy in the yard! 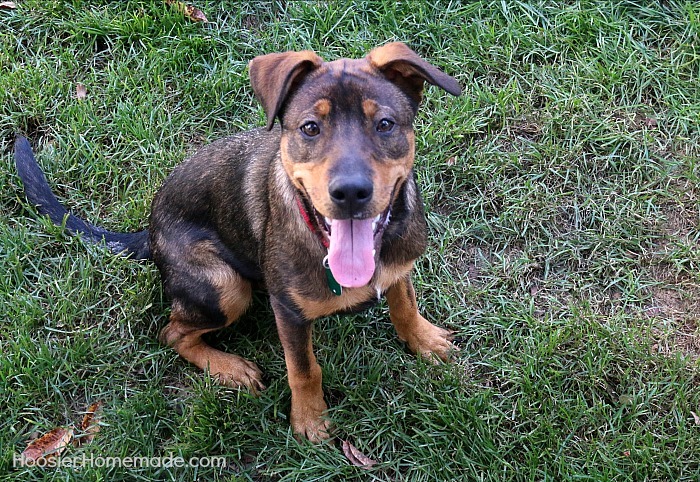 If you’re looking for a fur-ever friend, I’d recommend Petfinder! It’s the first site I always go to when searching for an adoptable pet!